The Crystal Palace was one of the signature landmarks of Victorian London. It was built to house the Great Exhibition of 1851, which showcased many of the wonders of the Industrial Revolution. After the Exhibition ended it was moved to a park on Sydenham Hill and remained there until it was destroyed by fire in 1936. 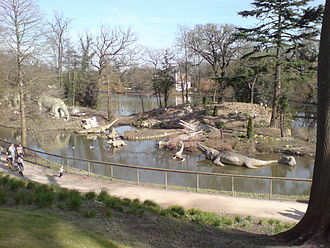 Besides the Palace, the park featured the famous Hawkins dinosaur statues, which were among the first scholarly recreations of those prehistoric creatures. Of course, many of their conceptions were spectacularly wrong. Unlike the Palace, these statues remain and were extensively restored in 2002. 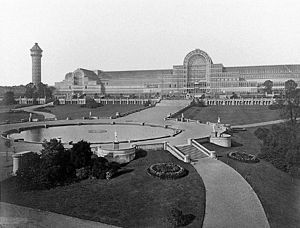 At the time, the Crystal Palace was the largest glass-walled structure in the world. It must have been a beautiful sight illuminated from within on a foggy London night. Photographs of its interior show it was big enough to enclose living trees. 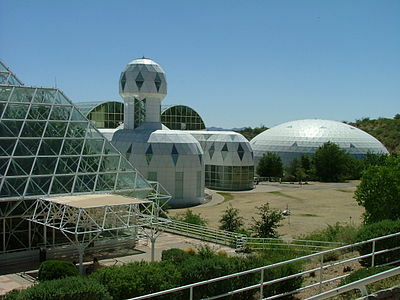 This reminded me of visits to Biosphere 2 in southern Arizona, another large glass structure, and I wondered how the two compared. According to Wikipedia, the Crystal Palace had 772,784 square feet on the ground floor alone. I didn’t take the time to find accurate specs for the biosphere, but an article I found on the design site Curbed estimates it as 2.5 times the size of a football field. If that includes the end zones, that would be 142,000, or less than one-fifth the size of the Palace. That would make the Victorian edifice impressive even by today’s standards. Therefore, the Crystal Palace seemed like the perfect place for Arlys and I to use as the backdrop for our fictional First Royal Epicurean Exhibition in our upcoming Ione D novel. It makes the perfect backdrop for old-fashioned intrigue and mayhem. Too bad it’s not around anymore! Watch this site for updates and previews of future Ione D and other steampunk adventures, including a sequel to my 2015 novel Fidelio’s Automata.